Capacity to handle up to 30,000 lbs. Creep and Stress Rupture Testing is designed to analyze the amount of stress a material can safely withstand until failure and elongation. These are important indications for products in the aerospace, automotive, power generation, medical, oil & gas and many other industries. 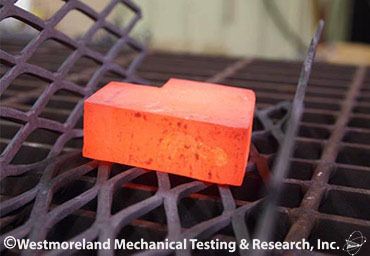 Creep and Stress Rupture Tests are conducted at temperatures up to +2200°F to either ASTM E139 (creep and smooth-bar stress rupture) or ASTM E292 (notch tests). Temperature and creep readings are recorded by computers and continuously monitored to ensure utmost accuracy. The creep test program is capable of recording strain readings up to 120 times per hour. This information is utilized to maintain temperature tolerances during a test and also to access a temperature history report for each completed test. The test temperatures are monitored by a centrally located multi-screen monitoring system. Stress and creep rupture tests are also conducted in various environments under vacuum or inert atmospheric conditions. Tests are usually performed on materials that exhibit excessive corrosion at elevated temperatures in an air environment. The reduced section of a creep test specimen can also be strain-gaged as a means of measuring the amount of strain during testing. 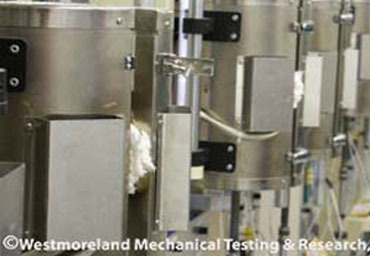 The Creep and Stress Rupture Testing lab at Westmoreland Mechanical Testing & Research has the capability to perform a variety of tests, such as: Creep Rupture, Stress Rupture, Cyclic Rupture, Static Notch and Embrittlement Relief. Cyclic Rupture Testing is designed to load and unload a test sample at certain time intervals. The test temperatures range from room temperature to +2200°F. Prior to starting a test, four strain gages are attached to the test specimen to insure that bending strains are within specification requirements. 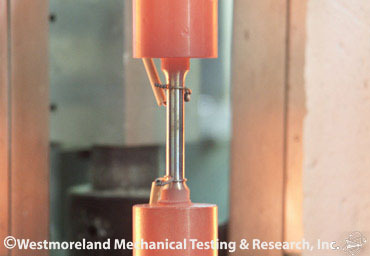 The Static Notch Test is performed at room temperature under a constant load for a minimum of 5 hours to determine if the material is notch sensitive at room temperature. The Embrittlement Relief Test is also performed at room temperature, but for 200 hours under a load of some percentage of either the yield strength or ultimate tensile strength. 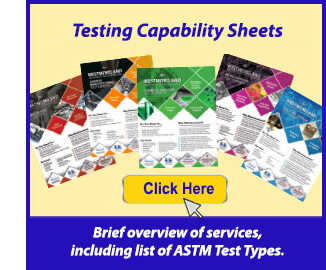 Typically, this test is conducted in accordance with ASTM F 519 at 75% of the yield strength to determine if the material is susceptible to hydrogen embrittlement. WMT&R has the capability of testing a number of various sizes and shapes of test specimens, some of which are shown below. The on-site Mechanical Engineering laboratory is staffed by specialists and engineers in product evaluation of actual prototype components and subassemblies. From custom design and fabrication of fixtures, to conducting the test, our mechanical engineers have the expertise and resources to assist our various testing departments in delivering data to customers in an efficient and timely manner. The on-site high-technology, full-service Machine Shop at Westmoreland Mechanical Testing & Research encompasses a clean, temperature-controlled environment and state-of-the-art equipment, with the ability to machine all test specimens onsite. In addition to machining standard specimens, our Machine Shop has the ability and resource to custom-design and machine fixtures for testing finished parts, odd shapes, and difficult or exotic materials. Our reputation for quality machining and superior turnaround times brings us production work from other laboratories and mills. With our advanced in-house capabilities, and substantial engineering experience, we are known as specialists in low-stress grinding and machining sub size specimens to very close tolerances. These tests cover the determination of the amount of deformation as a function of time (creep test) and the measurement of the time for fracture to occur when sufficient force is present (rupture test) for materials when under constant tensile forces at constant temperature. These tests cover the determination of the time for rupture of notched specimens under conditions of constant force and temperature. Rupture life of notched specimens is an indication of the ability of a material to deform locally without cracking under multi-axial stress conditions, thereby redistributing stresses around a stress concentrator. The notch test is used principally as a qualitative tool in comparing the suitability of materials for designs that will contain deliberate or accidental stress concentrators. This test method describes mechanical test methods and defines acceptance criteria for coating and plating processes that can cause hydrogen embrittlement in steels. Subsequent exposure to chemicals encountered in service environments, such as fluids, cleaning treatments or maintenance chemicals that come in contact with the plated/coated or bare surface of the steel, can also be evaluated. Plating/coating Processes—Unstressed test specimens are cleaned, plated/coated, and baked (if applicable) in accordance with the specification to which the process is to be qualified. Specimens are then maintained under a sustained load in air to measure the time to rupture/completion of the test period. Service Environments—Specimens are tested in the service environment. The sequence of exposure to the environment and loading shall be as defined in details of testing in service environments. If plated/coated test specimens are to be utilized for evaluating a service environment, then the plating/coating process must first be determined to be acceptable in accordance with plating/coating processes. The Creep and Stress Rupture lab at Westmoreland Mechanical Testing & Research has the resources, expertise and equipment capacity to meet requests and provide quick turnaround. Our extensive number of machines and fixtures ensure your project won't have to wait. ON TIME DELIVERY is our commitment to our customers.